Warm weather is here and it’s the perfect time to spend a day strolling through the booths at a wine festival. 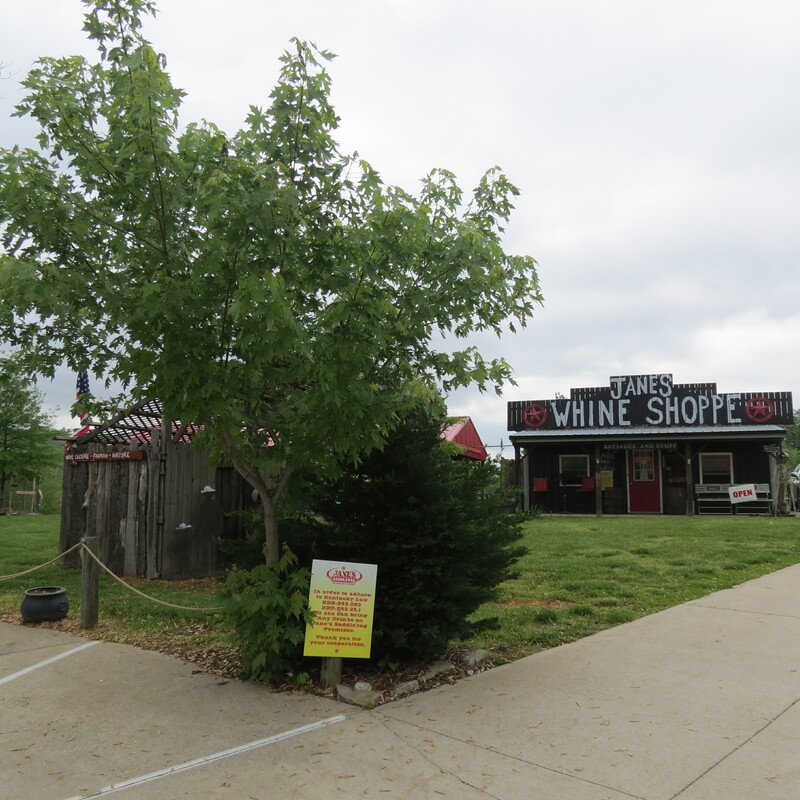 Jane’s Saddlebag, in Boone County, near Big Bone Lick, is having a wine festival featuring Kentucky wines and crafts, on May 30, from 11 AM to 8 PM. Admission is $15.00, and includes a commemorative glass, 6 tasting tickets, and free parking. Tickets can be purchased at the event or bought from Jane’s website (see my link) early at a discount. In case of a rain day on May 30, the festival will be on Sunday, May 31. Wineries from around the state will be meeting wine lovers and sharing tastes of their various wines. Some of those who will be at the festival are local, such as: Verona Vineyards, Rose Hill Winery, Atwood Hill Winery, StoneBrook Vineyard and Winery, Elk Creek Vineyards and Winery, and Redman’s Farm Winery. Others, such as, Lovers Leap Vineyard and Winery, Forest Edge Winery, Horseshoe Bend Vineyard and Winery, and Wight-Meyer Vineyard and Winery, will be traveling from Central Kentucky. There will be music provided by local musical groups throughout the day, as well as vendors with crafts and wine related items, and food choices. 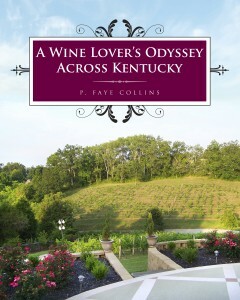 I will be there signing A Wine Lover’s Odyssey Across Kentucky. 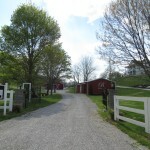 I’d love to meet you and talk about one of my favorite topics – Kentucky wine. Also, you can ask me about the new book I’m working on right now. Verona has become a wine lovers destination. No, not the Verona that usually comes to mind, but Verona, Kentucky. For the last few years, wine lovers have been finding their way to Verona Vineyards; now they have another winery to visit less than three miles away. Brianza Gardens and Winery opened their doors to visitors on April 25, 2015. While their address is officially Crittenden, they are just two and a half miles from the Walton exit off of I-75, on Salem Creek Road. Tony Parnigoni, with a family heritage that traces its roots to an Italian region called Brianza, left the corporate world to fulfill a dream of owning a winery. Four and a half years ago, he purchased a farm in Boone County and began planting his vineyard of over 1900 vines. He, his 3 children, and friends tend the vineyard. Tony is honing his craft as a winemaker with Jim Wight, one of Kentucky’s finest winemakers, as his mentor and consultant. 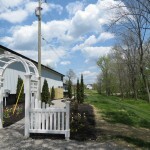 Last Saturday was such a beautiful day, we decided to visit one of Kentucky’s newest wineries. Brianza Gardens and Winery was a pleasant surprise and good news to this wine lover. 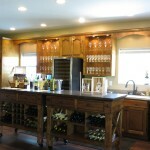 New wineries often have this unfinished look to them and their wines are not at their best. This is definitely not true of Brianza. As you arrive at the drive and follow the signs to the parking lot behind the tasting room, you find yourself hoping the wine is good because the place is beautiful. You won’t be disappointed. 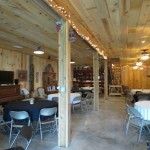 The tasting room is lovely. I was especially impressed by the unique tasting table that made use of three barrels with an oak top. 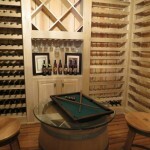 As for the wine, most wine lovers will be delighted with the choices and with the quality of the wine. His dry whites, such as Vignoles and Chardonnay are both excellent. The Chardonnay is aged in stainless steel giving it a delightful taste of the grape itself. Tony’s current selection of reds are from grapes purchased from Lovers Leap Vineyard and Winery and are very good, but coming in September he will be offering an estate Noiret. We had the opportunity to try that as well and it will be exceptional. As his grapevines continue to develop, more offerings will be estate varietals as well. 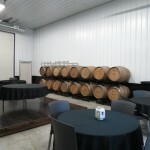 The tasting room is currently open only on Saturdays, 10 to 6, or by appointment. Tony has also created an event venue, with a reception room and a special room created for brides. 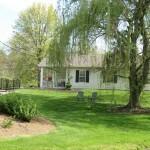 There is a cottage on the grounds that can be rented as a B & B. 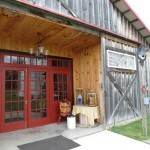 In the tasting room, local cheeses and a locally made bread can be purchased for an impromptu picnic. Visitors can wander around the grounds and garden. Look for the website in my Links. I definitely recommend that wine lovers make plans for a visit to Brianza Gardens and Winery. You will be glad you did. Last weekend, we enjoyed a leisurely afternoon visiting wineries in Verona. 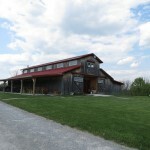 This was our first trip this spring to Verona Vineyards. There are some changes since our last visit. A new covered seating area outside, and a lovely special wine room are two of the nice additions. As usual, the atmosphere is inviting, the service friendly, and the wine is excellent. 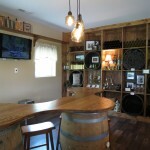 Dan and Peggy Montgomery offer a wide variety of wines for wine lovers. New this year is a Malbec, as well as two red blends. Cabernet Franc and Dornfelder are back and just as popular. 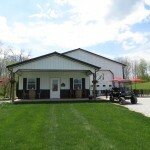 Verona Vineyards is a perfect place to enjoy an afternoon relaxing with a bottle of wine. Check out their link from this site.